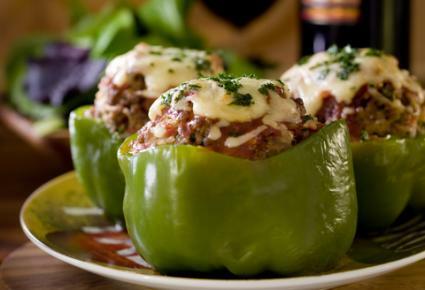 Stuffed peppers are one of those delicious comfort foods that really satisfy your hunger. Whether you prefer a meatless stuffing or you like your peppers stuffed with ground beef, sausage, or some other meat, here are five great recipes for you to try. 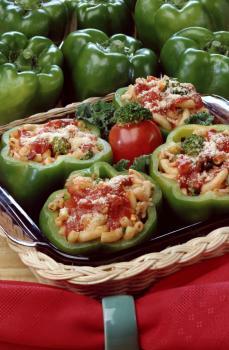 This recipe for traditional stuffed peppers is very convenient for the cook on the go. Just assemble all the ingredients in a Crock-Pot as directed, set the time and temperature, and go about your day. Wash the peppers, slice off the tops, and remove the core and seeds. Arrange them upright in the Crock-Pot. In a large bowl, combine the beef, rice, onion, eggs, half the crushed tomatoes, mozzarella, garlic, and spices. Use your hands to mix all the ingredients together well. Fill each pepper with the mix as evenly as possible. In a bowl, combine the other half of the crushed tomatoes and the beef broth, and pour the mix in the Crock-Pot around the peppers. Cover and cook on high for about six hours or on low for about eight hours. Use a meat thermometer to make sure the internal temperature of the peppers reaches 160 degrees Fahrenheit. Add a generous sprinkle of mozzarella cheese to the top of each pepper, put the lid back on, and continue cooking until the cheese melts. Serve the peppers sprinkled with a little parsley for garnish. 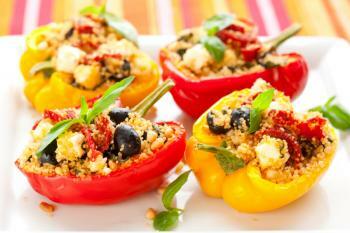 These couscous-stuffed peppers are as attractive as they are delicious. You can use chicken stock in the recipe for a wonderful flavor base or use vegetable broth if you prefer a vegetarian-style dish. Cut the tops off the bell peppers and remove the core and seeds. In a casserole dish brushed with olive oil, arrange the peppers and bake them for about 20 minutes or until they become tender, but not completely soft. Remove them from the oven, but keep the heat on. In a saucepan, bring the stock or broth to a boil. Stir in the couscous and lemon juice, and then turn off the heat. Put a lid on the pan, and let it sit while you prepare the sauté mix. In a sauté pan, heat the olive oil over medium heat and add the chopped onion and basil. Sauté, stirring occasionally, for about five minutes or until the onions begin to turn translucent, and then turn off the heat. Remove the lid from the couscous, fluff it with a fork, and stir in the tomatoes and tomato paste. Spoon the couscous mix and the olives into the sauté pan, stir to combine all the ingredients, and then toss in the feta last. You can add a little salt to the filling if you think it needs it. Fill the peppers with the filling mix, and bake them 15 to 20 minutes. Garnish each pepper with some basil, and serve. 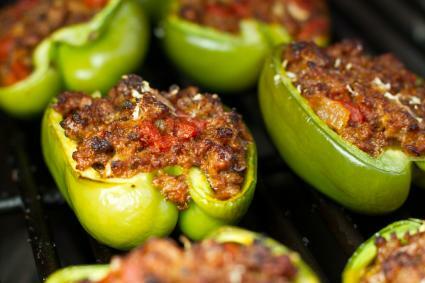 Stuffed peppers are often the centerpiece of a meal, but this recipe works well as a side dish since you only use half of a bell pepper per serving. This is meant to a be a very light and fresh dish, but you can top each serving with some mozzarella or Parmesan near the end of the baking time, if you like. Toss in the Canadian bacon, mushrooms, tomatoes, and zucchini, and cook for about five minutes until just tender. Sprinkle the mixture with a little salt. While the sauté mix is cooking, slice the peppers in half from top to bottom and remove the core and seeds. Lay the four halves flat in a baking dish that's lightly brushed with a little olive oil, and divide the sauté mix evenly between all four halves. Bake for about 30 minutes until the peppers are tender, but not mushy. You can bake them longer if you prefer a very soft pepper. 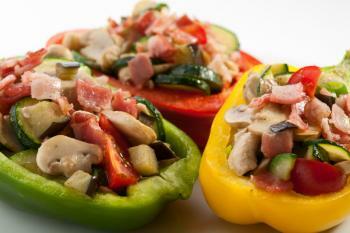 Grilling really brings out the sweetness of the bell peppers, especially if you use red, orange, and yellow peppers. You can prepare these peppers on an indoor grill, a gas grill, or a charcoal grill, whichever you feel most comfortable working with. Wash the peppers, cut them in half lengthwise, and remove the cores and seeds. Lay them on a tray with the insides up. In a sauté pan, cook the sausage, breaking it up with a spatula, until it's no longer pink. Drain off the fat. In a large bowl, combine the tomato, cheeses, garlic, basil, and oregano. Add the sausage, toss all the ingredients together, and divide the mix evenly between all six pepper halves. Place the peppers on the grill and cover them with the lid or a sheet of foil. Grill them for about 25 to 30 minutes, or until the peppers are just tender yet still come off the grill without falling apart. Serve warm with garlic bread on the side. The taste of bell peppers really complements the creamy homemade macaroni and cheese stuffing. This dish is great as a main course, but it also makes an especially delicious side dish for meatloaf, pork chops, or pan-fried chicken breasts. Wash the peppers, slice the tops off, and remove the cores and seeds. In a large pot, bring salted water to a boil. Pour the macaroni in, and cook according to the package directions. When the macaroni is just tender, turn off the heat and pour the pot's contents into a large colander. Let the macaroni drain for about a minute, and then pour it back into the pot. In a medium saucepan, melt the butter over medium heat. Whisk in the flour and continue whisking and cooking for about five minutes to form a roux. Whisk the milk in gradually, and continue whisking for about five minutes until the mixture is thick and creamy. Turn the heat down to low, and stir in the cheeses, salt, and pepper. Stir slowly and continuously until all the cheese has melted and thoroughly combined with the sauce base. Pour the cheese sauce over the macaroni and stir until the sauce is mixed in well. Brush a baking pan with the olive oil, arrange the peppers in the dish, and fill them with the mac and cheese. Spoon a little tomato paste on the top of each pepper. Add about one inch of water to the pan to create some steam, and bake for about 40 minutes or until the peppers are tender. Serve immediately. Part of the fun of cooking is putting your own spin the recipes you use. Feel free to adjust the spices, and cook the peppers to the exact tenderness you desire. Once you begin thinking out of the box, there are hundreds of ways to stuff peppers. Let your culinary imagination run free, and you just might create a new classic.